Dean Baker was the first to notice that a Washington Post article on the budget deficit came from the Fiscal Times, a newly-formed “news service” funded by billionaire Peter G. Peterson, who has been using his vast fortune to try to cut back and/or privatize Social Security and Medicare for the last two decades. As Baker noted in his blog “Beat the Press,” the Post’s New Year’s Eve article conveyed Peterson's budget fear-mongering view, but did not mention Peterson’s funding of the Fiscal Times and the main sources cited in the article. Baker’s discovery was picked up by other blogs, and the issue was highlighted in a New York Times piece that was published on January 5th. Baker co-signed a letter sent to the Post’s Ombudsman protesting the article, and another letter to the Chairman of the Post. After the Ombudsman printed this disappointing reply, Baker fired off another critique. As the Senate is set to vote on a fast-track commission on the budget deficit next week, this scrutiny of Pete Peterson’s agenda and his ties to the Fiscal Times could not come at a better time. Dean Baker’s New Book is now Available! Dean Baker’s new book, False Profits: Recovering From the Bubble Economy is officially released today! In this sequel to Plunder and Blunder: The Rise and Fall of the Bubble Economy, Baker recounts the causes of the economic meltdown, outlines how policymakers failed to recognize the warning signs, and offers a thoughtful progressive program for rebuilding the economy and reforming the financial system. The book is available here. And if you’re in Washington DC on January 28th, please join Dean Baker at 6:30pm for a book talk at Busboys and Poets, 2021 14th St. NW, Washington, DC 20009 (202) 387-POET (7638). For more details about this free event, click here. In the wake of the devastating earthquake that hit Haiti, CEPR has responded by working with other organizations - such as Jubilee USA and the Institute for Justice and Democracy in Haiti - to promote the use of grants, rather than loans, from international financial institutions’ assistance to Haiti. This was prompted by news that the International Monetary Fund would require Haiti to pay back its $100 million in assistance money. CEPR staff also raised the question of why the Obama administration has not yet provided Temporary Protective Status to Haitians in the U.S., as currently there are 30,000 Haitians awaiting deportation; and CEPR has worked to put experts, independent journalists, and relief workers in contact with major media outlets. CEPR staff will lead a workshop on Haiti at a conference on January 25, 2009 organized by TransAfrica Forum. Participants will include Congressional staff and other policy makers. Support continues to build for a financial speculation tax (FST). Dean Baker was one of 200 economists, including Nobel Laureate Daniel McFadden, James K. Galbraith, who signed a letter in support of the FST. Representative Peter DeFazio (D-OR) and Senator Tom Harkin (D-IA) have introduced bills calling for the adoption of an FST. Dean Baker continues to point out the benefits of the FST, responding to criticism here and offering it as a viable solution to address the deficit in an interview on NPR’s Morning Edition. And just today, Steven Pearlstein of the Washington Post endorsed the FST. CEPR Co-Director Mark Weisbrot just returned from Latvia, where he presented on the serious challenges facing Latvia's economy due to its overvalued currency, which is pegged to the Euro. Swedish, Austrian, and other European banks have put enormous pressure on Latvia to maintain the peg through the European Union, even though this is contributing to Latvia's worst-ever recession, and the IMF is also supporting this policy. Weisbrot's presentation immediately followed remarks by the Latvian Prime Minister, who attended the event along with most of the cabinet. While he was there, Weisbrot also had several meetings with other top policy makers and economists, and his visit was a top news story on all the major Latvian media and was covered by international media outlets as well. Weisbrot’s new column for The Guardian examines Latvia's economic problems in detail. CEPR’s 10th Anniversary webcast is now available in seven (briefly annotated) parts. Originally broadcast in September of 2009 and moderated by Jane Hamsher of firedoglake, the webcast features CEPR CO-Directors Dean Baker and Mark Weisbrot in a wide-ranging discussion of CEPR’s past, present and future. Once again, we’d like to extend our sincere appreciation to everyone who made this possible. To all of our friends, many thanks for your financial and moral support over the past ten years – we couldn’t have done it without you. We look forward to another ten years of setting the record straight…stay tuned! 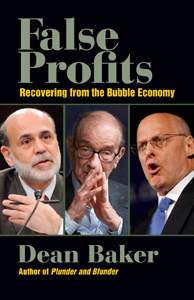 I have a new book out this month: False Profits: Recovering from the Bubble Economy. I felt the need to write this book because, remarkably, the people who somehow could not see an $8 trillion housing bubble still could not understand the bubble even after it wrecked the economy. It was as though their house had burnt down in a fire and they were checking on the burglar alarm. There is not a lot of mystery as to the source of the current problems. First and foremost, the country's top regulators, Alan Greenspan and Ben Bernanke, were incredibly incompetent in allowing the bubble to grow unchecked. This bubble drove the economy ever since the last recession. Predictably, high house prices led to an enormous construction boom. Soaring home equity also led to a massive consumption boom as people spent based on the newly created wealth in their homes. In its later years, the bubble was further inflated through complex financial engineering and, in some cases, outright fraud by the financial industry. While it would be desirable to have a better regulatory structure and it is important to fully prosecute the high level bankers who violated the law, this should not obscure the fact that the basic problem was very simple: the Fed committed one of the biggest policy blunders of all-time by allowing the bubble to expand unchecked. At this point, we have to push for the measures that will best help us recover from the disaster that Greenspan/Bernanke created. At the top of the list is getting people back to work. Second, we have to help the homeowners who got caught up in the bubble. Finally, we have to rein in our bloated financial sector. There are other simple policy solutions to what, in many cases, are actually simple problems. But there is a whole industry of professional lobbyists, many of them economists, whose job is to make simple problems appear complicated. False Profits, like my other writing, is an effort to assure people that the problems and solutions really are simple. That may put me at odds with many of the leading names in the economics profession. But, when it came to the bubble, most of them were wrong. I hope False Profits will help them better understand what caused, and how to cure, the current crisis. And I hope you'll find it a worthwhile read also. This past year has been a special one for the Center for Economic and Policy Research. CEPR was founded in 1999, so 2009 marked our 10th anniversary. Over the course of the year, we’ve had some time to reflect on how far we’ve come, and how much we’ve accomplished. From our humble beginnings just ten years ago, CEPR has grown into a force to be reckoned with. Fairness and Accuracy in Reporting (FAIR) named us the 15th most-cited think tank in the US in their annual study – up from #25 just last year. We’ve been cited over 7,750 times in various media so far this year – an increase of 1,100 over all of last year. We know that we couldn’t have survived - let alone thrived - without the help of friends like you: the thousands of people who believe in our mission, who help to spread CEPR’s message, and who support us financially. We are proud of the fact that we have accomplished so much given our small size and lean budget, and given our influence-free funding structure. Throughout our 10-year history, we have relied solely on the financial support of foundations and individuals. We take no corporate funding, no union funding, and no government funding. In these times of revolving door lobbying and billion dollar bank bailouts, we steadfastly maintain our independence. And CEPR was the most cost-effective think tank in 2008 measured by media citations and web traffic, ranking first in media citations per budget dollar for the fifth consecutive year, and first in web traffic per budget dollar for the second consecutive year. In other words, we aced our own “stress test”. As the end of our 10-year anniversary celebration draws near, we ask that you please help us to continue our fight into the next decade and beyond. We’ve had many successes over the course of the past year, but there is still much more to do. The recession drags on both here and abroad. Too many people are still unemployed and at risk of losing their homes. The “Washington Consensus” still influences much of our foreign policy. We need your financial and moral support – now, perhaps more than ever. We still have many more battles to fight. And we are committed to using your gift wisely and effectively. From all of us at CEPR, best wishes for a safe and healthy holiday season, and a happy New Year. University of Chicago economist Casey Mulligan has a post today at the New York Times Economix blog where he seems to argue that the current push for statutory paid sick days in the United States is ignoring the role of economic incentives. According to Mulligan, workers in countries with generous paid sick day policies stay home because of "incentives, and not the flu". I don't think Mulligan has been following the U.S. debate on paid sick days very closely. The U.S. debate is very serious about incentives. The current system --which does not require employers to provide paid sick days and leaves upwards of 50 million workers without paid sick days-- gives strong incentives to workers to go to work sick, lowering productivity and potentially spreading illness. 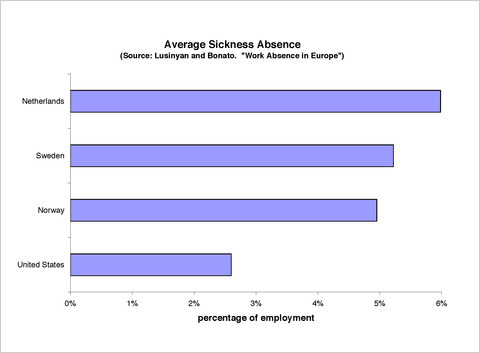 Of course, offering paid sick days also gives workers incentives to take time off when they are not sick. But, there is nothing in Mulligan's post that says where we should set the optimal level. He doesn't even make a case that the most generous systems in Europe are too generous, just that they lead to more sickness absences in some cases. For all we know, after we factor in the cost of contagious diseases, the most generous European systems might still be too stingy. In honor of our 10th Anniversary, CEPR hosted a two-hour live webcast. CEPR Co-Directors Dean Baker and Mark Weisbrot were on hand to answer questions from viewers, and Jane Hamsher of firedoglake was the special guest moderator. A new report from CEPR shows that unionization significantly boosts the wages of service-sector workers. The report, which was written by CEPR Senior Economist, John Schmitt shows that unionization significantly boosts the wages of service-sector workers. Specifically, the report finds that unionization raises the wages of the average service-sector worker by 10.1 percent, which translates to about $2.00 per hour. This report is the latest in a series of reports produced by John Schmitt on the advantages of unionization for lower-wage workers and other groups. CEPR Co-Director, Dean Baker appeared on GRIT TV with Laura Flanders to discuss the G-20 summit, together with Ann Lee, professor of economics at New York University and visiting professor at Peking University in Beijing, and Greg Denier, Communications Director of Change to Win. CEPR Senior Research Associate, Ha-Joon Chang was on Democracy Now! with Amy Goodman, where he discussed his book, Bad Samaritans: The Myth of Free Trade and the Secret History of Capitalism. Ha-Joon Chang, is an economist at the University of Cambridge specializing in developmental economics. In 2005, he was awarded the Leontief Prize for Advancing the Frontiers of Economic Thought. He is also the author of Kicking Away the Ladder: Development Strategy in Historical Perspective. The interview begins around the 15:00 minute mark. Sean Hannity asserted that the economic stimulus bill would amount to spending at least $217,000 for every job created, echoing a false calculation from a press release issued by the Republicans on the House Appropriations Committee and repeated by numerous media figures. In fact, by calculating the per-job cost by dividing the estimated total cost of the stimulus package by the estimated number of jobs created — and thus suggesting that the sole purpose of that package is to create jobs — these media figures ignored other tangible benefits stemming from the package, such as infrastructure improvements and education, health, and public safety investments. One of the little-noticed but most important international responses to the current world recession is the reassertion of power by the International Monetary Fund, which ten years ago was the most powerful financial institution in the world. The IMF answers mainly to the U.S. Treasury Department, although it is ostensibly a 185-country member organization. The Treasury Department is using the IMF the same way it did ten years ago, during the last major financial crisis, in East Asia. Treasury is trying to re-establish the IMF’s former pre-eminent position as gatekeeper to any rescue funds. This would enable the IMF/Treasury to choose which developing countries get loans and what conditions are attached to the lending. The IMF played a disastrous role in the Asian crisis, which is one of the reasons that its portfolio shrank to almost nothing over the last decade, and any country that could, avoided them like the plague. Now they are back, unreformed and unreconstructed. Despite the G20 meeting’s lip service to making some developing countries partners in international financial reform, the idea of giving them any more representation in the IMF’s decision-making is decidedly off the agenda. China, the world’s second-largest economy with 1.3 billion people, has just 3.6 percent of the vote in the IMF; the United States has 16.5 percent. But since Europe and Japan virtually always side with the United States, the developing countries are effectively without a voice. While the IMF wants the rich countries to adopt large stimulus packages and lower interest rates to counter the world recession, it is requiring its borrowers — so far Iceland, Hungary, Ukraine, and Pakistan — to do the opposite. Perhaps even worse, some countries will need to adopt capital controls, to prevent damage from money fleeing the country; the IMF will use its muscle to prevent that. Washington and the U.K. are trying to get the countries with surplus reserves — mostly China and the Gulf states – to pitch in to the IMF. So far, only Japan is willing to do so. Hopefully, the developing countries that have excess international reserves and want to help those who need them will find other ways to channel the money. Original published on the Hill Blog. With all the election news about increased turnout from people ages 18-29, television hosts seem giddily intrigued by the political habits of “young people,” as if we were some exotic and alien demographic of the American electorate. The truth is, we Millennials (is that what they’re calling us?) are Americans like everyone else – just younger. We may not have lived through history, but we know the story. We may not have a family right now, but we will someday. As citizens, we’ve taken advantage of all the new opportunities afforded us in the 21st century. We’ve graduated from high school and college at higher rates than in recent memory. We’ve contributed to the increased productivity from labor in the last decade. We were the first generation to grow up with computers, and we still give our parents a computer lesson every now and then. In short, we’ve been pretty good citizens. And yet, we’ve been the hardest hit by the wage stagnation in our economy over the last three decades. After adjusting for inflation, the wage of the typical 18-29 year-old worker was about 10 percent lower in 2007 than it had been in 1979. Despite being more tech-savvy and better educated, we’re getting paid less. A lot of this is outside of our control, influenced by political decisions in Washington and massive fluctuations in the economy. But there is one surefire way that young people can improve their living standard – unions. A new report from the Center for Economic and Policy Research (CEPR) analyzes data from the Census Bureau’s Current Population Survey (CPS) and finds that unionized young workers (age 18-29) earned, on average, 12.4 percent more than their non-union peers. The trend was the same even in the lowest-wage occupations. The average non-union young worker made $8.74 per hour, while the average unionized young worker made $10.62 per hour. Unionized workers were also more likely to have good benefits, like employer-provided health care and pension plans. CEPR Co-Director Dean Baker attended a panel discussion on the economics of inequality on September 30 at the Institute for Policy Studies. Dean spoke about the 'financial crisis' and argued that a tightening of credit is normal in the context of a recession and that a bailout is uneccessary. His weekly columns on the economy can be found here. Jared Bernstein of the Economic Policy Institute and Barbara Ehrenreich of the Institute for Policy Studies also spoke. The discussion was moderated by Chuck Collins, the Director of the Inequality and the Common Good Project at IPS.